Like A-Rod, Sanchez About To Take On The World. Alone. 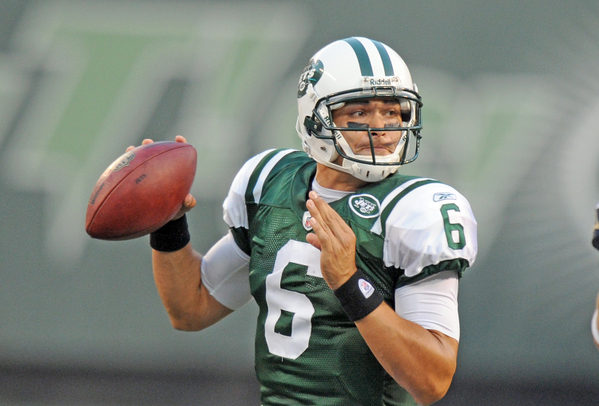 Just four years ago, I compared Mark Sanchez, to Derek Jeter. Now, he more closely resembles Alex Rodriguez. Like a young Jeter, Sanchez once exhibited confidence, poise and passion. He also found ways to win big games. 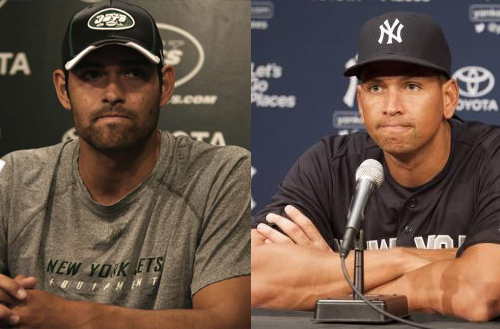 Both Sanchez & A-Rod will face hostile crowds, for different reasons. Now, like A-Rod, he’s all alone. He has the majority of his own fan base, and people within his own organization seemly rooting against him. He’s saddled his team with an immovable contract, been involved in controversial plays on the field, and controversial situations off it. Yet, Sanchez takes the field tonight in Detroit looking to prove all doubters and dissenters wrong. A-Rod begins a similar fight tonight in the Bronx, but for much different reasons, obviously. A-Rod cheated his organization. Sanchez was simply cheated by his. A-Rod made his own poor decisions. Sanchez was a victim of those made by others. A-Rod deserves the ridicule. Sanchez deserves a fair shot to prove he can win again with proper support. Tonight, two well-paid, and well-famed New York athletes will take center stage. Both are polarizing figures. Both will be booed by their home crowd. At 38 years-old, A-Rod is simply playing out the string. At 26 years-old, Sanchez potentially has his best years ahead of him. If he’s going to spend them playing in New York, the kid from SoCal needs to be confident, poised, and passionate again. He’s got to find ways to win big games again. He’s got to be more like the face of the Yankees. Less like the face of Biogenesis. When 22 year-old Michael Floyd marches across the Radio City Music Hall stage during tonight’s NFL Draft, he will officially shed his amateur status and transition towards life as a professional athlete. The wide receiver out of Notre Dame – expected to go early in the first round – will hold up his new jersey, flash a smile and pose for pictures with NFL Commissioner, Roger Goodell. He’ll do all of this while sporting a designer suit, custom made for the big event. After all the pomp and circumstance, he’ll slip into something a little more comfortable – something tailor-made for his personal lifestyle rather than tonight’s gaudy Broadway spectacle. Like many of today’s athletes, Floyd will throw on some clothing from Five Four. It’s the hottest line of apparel you’ve likely never heard of. Its reach covers a wide variety of entertainers, celebrities and athletes. Jay-Z, Dr. Dre, Zac Efron and Larry King have all been spotted rocking Five Four. Top players like Blake Griffin, Derrick Rose, Troy Polomalu and Mark Sanchez wear it too. Their garb is everywhere, especially in the sports world. I wanted to know why? Why Five Four? Why not Nike, Adidas, or some designer label? When I asked Five Four Co-CEO/Founder Andres Izquieta, his response was simple. Izquieta and Dee Murthy started Five Four as 21 year-old students at the University of Southern California in 2002. Since its inception, the modern, yet classic-looking “Lifestyle Brand” has been all about setting goals, dreaming big, passion, winning and success – all core values shared by up-and-coming athletes looking to make it on a professional stage. 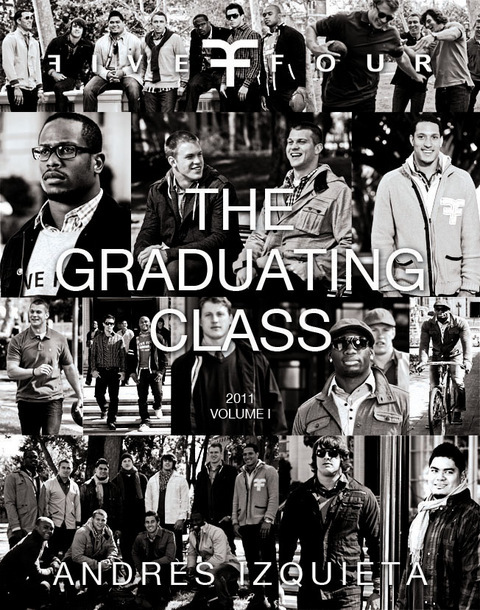 Often portrayed as superheroes in the media, The Graduating Classdelicately humanizes each player, peeking in on their insecurities and anxiety leading up to the biggest day of their lives – draft day. Casually decorated in Five Four, each player comes off as a “regular guy” – a concept that helps readers relate to these larger-than-life figures. Though Five Four is primarily a West Coast brand – their one retail location is in Los Angeles – their product is carried in over 400 stores nation-wide and is worn by athletes and celebrities everywhere. This May, they will introduce Five Four Club, a men’s subscription service that will serve as a personal stylist for men. They also plan to introduce a line of footwear this June. Like many of the young players drafted tonight, you may have never heard of Five Four Clothing. Projects like The Graduating Class are helping to spread the word, and expose it as a brand of choice among many athletes. Especially players like Michael Floyd, a man who will realize his dream tonight. When he does, his life will change forever. His Five Four wardrobe won’t. Everyone got their swings in. 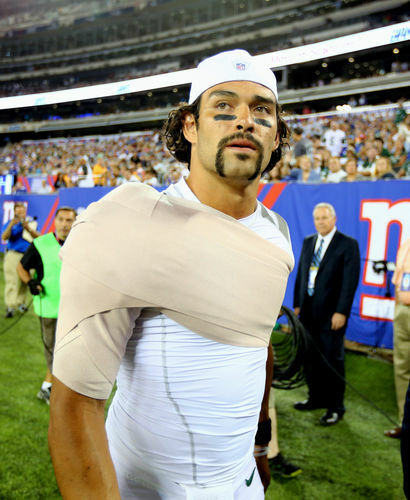 For three months, Mark Sanchez was repeatedly beaten like a piñata. After developmentally taking a step back in 2011, Sanchez was strung up and hung from a tree, allowing anyone with an opinion to take their cuts. No one was able to break him open, but we still found out what’s inside. Despite taking more hits in the press than he did on the field, Sanchez remained strong and dignified. He withstood the verbal thrashing, refused to get into a war of words, and respectfully allowed things to play out. 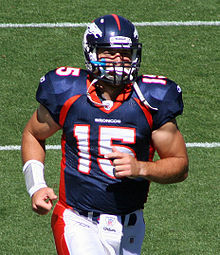 He weathered the storm – mostly hot air blown by Santanio Holmes and a handful of unnamed teammates – and survived the Peyton Manning rumors. He remained quiet for three months, then loudly resurfaced last night. 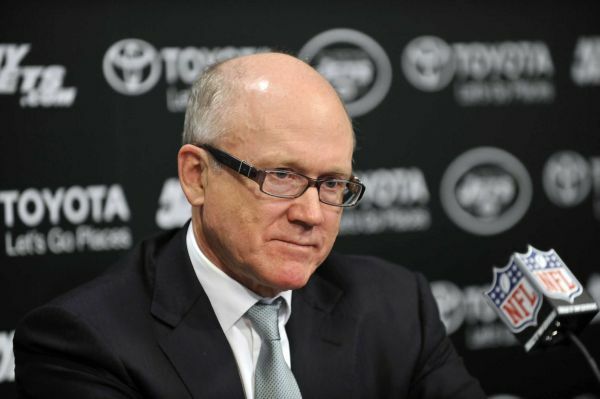 That’s when the New York Jets left little doubt about where their loyalties rest. They made Sanchez one of the highest-paid players at his position with a three-year contract extension that included $40.5 million in “new money,” according to ESPN. Sanchez took the opportunity to respectfully break his silence, and reiterate his dedication to the organization that drafted him in 2009. Surely, this was the perfect opportunity for Sanchez to take a few swings of his own at those skeptical unnamed players…right? Wrong. As he usually does, Sanchez took the high road. There was no panic in Florham Park. 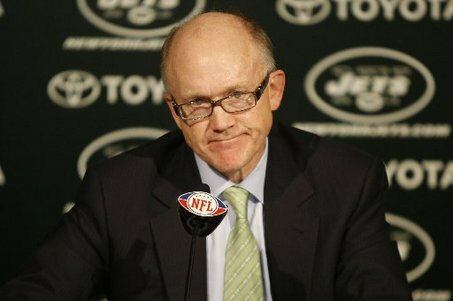 Even after it became apparent that Peyton was not their “Mann,” the Jets felt confident enough in Sanchez to make a statement, and lock him up. There is no valid reason not to believe in Sanchez, despite the numbers he put up in his third season: 16 games started, 3,244 yards passing, 24 TD, 18 INT, 8-8 record. Oops, those are Eli Manning’s third season stats from 2006! It’s an easy mistake to make since Sanchez’s 2011 numbers were eerily similar: 16 games started, 3,474 yards passing, 26 TD, 18 INT, 8-8 record. How did Eli do in his fourth season? Check his ring finger. Can Sanchez make the same progression? There will still be critics. 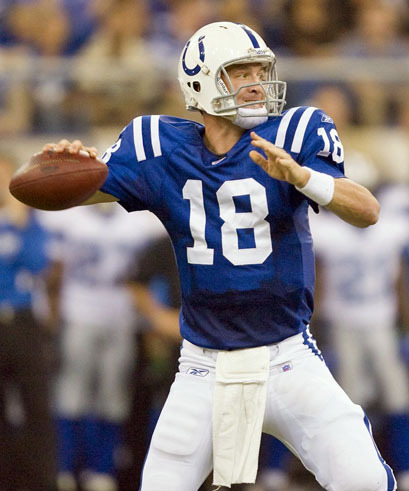 Many will claim this new deal is a PR stunt, another attempt to coddle the young quarterback, or an apology for letting him twist in the wind during the Manning sweepstakes. All valid questions. Sanchez won’t pay any attention to them, though. When you play quarterback in New York, everyone wants to take their cuts, and try to knock you down. They won’t break him open though. There’s no need to. We already know what’s inside.